Private beach bungalows, a dive center, great snorkelling from a superb beach, dolphins, lobsters, the occasional dugong, and birds of paradise. Perfect. Corepen Homestay occupies a great beach in a fabulous southern Gam location. Seven private bungalows and a two room family beach bungalow are available. Five of the private bungalows are on the beach and over water at high tide. Two private bungalows are available on land at a rate about 11% below that of the beach bungalows. All rooms sleep two on raised double beds which include sheets, pillows and mosquito nets. Each room is supplied with a pair of chairs and a small table which can be used in the room or to take advantage of verandah ocean views. Meals are served in a beachside dining shelter and drinking water, tea and coffee are always available there. Corepen Homestay bathroom and toilet facilities are housed in a three room shelter with a coral rubble floor, Western style toilets and bucket bathing. Good mobile phone reception is available at Corepen and electricity is provided by generator from sunset to around midnight. Basic supplies can be purchased in Yenbeser village which is a ten minute boat ride away. Rubbish disposal is a problem at Corepen, as everywhere else in Raja Ampat. Please do take all inorganic trash like plastic and dead batteries away with you when you leave. English is spoken at Corepen Homestay. Waisai – Corepen Homestay transfers cost IDR 500,000 each way (per trip, not per passenger). Transfers are by longboat which can carry up to six passengers. There’s a lot to do at Corepen Homestay. 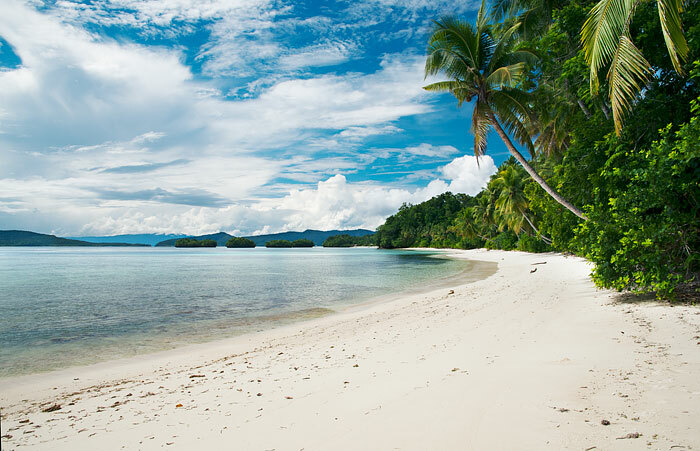 Located in a private cove on one of Raja Ampat’s best beaches, Corepen has great snorkelling at the door. Entry to the water is easy due to the sand bottom, which transitions to rich coral gardens with bountiful sea life. At low tide long beachwalks are possible and a Corepen also offers a guided 30 minute walk into the jungle behind the homestay to see the dawn displays of Red Birds of Paradise. The walks begin before dawn (bring a flashlight!) and cost IDR 100,000 per person. Others of the many bird species that can be observed at Corepen include cockatoos, parrots and ground dwelling mound builders known locally as maleo. Yenbeser village is close by, as are the attractions of Kri, Friwen, Arborek and Kabui Bay. Corepen Homestay has an on site dive center operated by Enzo and Maria (who were originally based at Kordiris Homestay). Prices are in Indonesian Rupiah. Please note that you need to add the daily equipment hire charge of 150,000 to the prices below. A sightseeing tour that explores the rich mangrove habitat that separates Corepen’s beach from the island of Gam, passing through mangrove tunnels rich with birdlife. The trip costs IDR 300,000, shared by passengers (maximum of six). Snorkelling and sightseeing tours can be arranged as desired. The table below shows prices in Indonesian Rupiah for the most commonly requested tours. The prices are per boat and are shared by passengers. The longboat used can accommodate a maximum of six passengers. Hello, I just would like to ask about the dive center owner Enzo. It seems he is not there anymore as the recent comments are not mentioning his name. Is he now back to Italy or move to somewhere else, can anyone tell please? Does anyone know if it is possible to go snorkeling in the mangrove bay behind the homestay? We were told that it was unsafe to swim in there Bertrand. This was our group’s (6 pax) first homestay and from the start we felt truly welcomed at Corepen. Insemina met us at the tourist center dock and we got settled in and had a delicious and plentiful lunch. We stayed 4 nights. Food was great and Sandy helped us plan for activities each night so we knew what we were doing the next day. Multiple toilets and washing up rooms made for comfort at a moderately busy homestay that supports diving as well as other activities. The trek to see red bird of paradise was not so good as the trail is in poor condition. They really need to improve that trail! The guide can’t communicate about the birds in even a tiny bit of English, and is thus only useful for getting the group to where you might glimpse displaying red birds of paradise. Birding around Mandarin Homestay was MUCH BETTER, but it’s luck, so worth giving it a go here, too. House reef was good, but you can’t get out to it at low tide. We were there for the neap tide which was so low we wondered if a Tsunami was coming (of course not). Each morning we took boat trips to snorkel: Friwen’s Wall, Sawaredek and Yanbuba Jetties, the “Bat Island”, and enjoyed a visit to Friwen village to look for flip flops. The staff were so much fun and often brought along snacks for us like mangos, cookies, tea and coffee. We hated to leave, and one of our group members made a special effort to return for a few more nights at Corepen because he loved the staff so much. Hey “MONKEY”!!!! We (couple, 30 years old, experienced divers) spent one week at the Corepen homestay in December 2018 and did 10 dives each. + We dove with Sandi, Harry and Jeffrey. They are doing a great job and are all experienced guides. Their English is really good and everyone we met felt safe all the time. + The dive shop is basic but good. There is enough fresh water and space to rinse and hang the diving equipment. We brought our own equipment so we can’t comment on the rental equipment. + The food was good and we always had enough to eat. The variety was (for Raja Ampat) really good and they even served chicken every two or three days. + The bungalows are basic but have a great view and are right on the beach. + The snorkeling in front of the homestay is nice but not exceptional. – In December they only had one western toilet, one bucket shower and one squat toilet. For the amount of bungalows that was definitely not enough. It seems like in the meantime they built more facilities, so that should be better now. – It’s not really a negative point but it doesn’t feel like a homestay. You don’t really meet the family (if you’re not asking around) and there are quite a lot of bungalows. I recently spent five days at Corepen and had an amazing expeience. The bungalows were great; the highlight being the hammocks out front. They were the perfect place to relax and enjoy the incredible views after a morning of diving. Food was good. Toilet and bathing facilities were adequate. The diving was amazing. Sandi, Maria, Harry and crew were fantastic. They clearly know the area very well. Their English is very good. They take very good care of the divers and, even though I am not an experienced diver (I had done 10 dives when I arrived), I felt very safe. The equipment was in good shape. If diving is what you want to do, this is the homestay to choose. I wouldn’t particularly recommend the bird of paradise walk. We didn’t see anything. The only real downside was that we didn’t have much interaction with the family who run the homestay. I tried a couple of times to engage them in conversation (admittedly in my not-so-great Indonesian) but they didn’t seem very interested in much interaction. This is a small downside though since Sandi and Maria were so helpful. I‘m not a big review writer but as the last two are a bit sad I think I want to add one. So, the bathroomsituation got improved. There are 2 showers now and 2 western toilets (also with seat). They got cleaned every day. The Bungalows are very basic. But actually a hammock is all you need. And each bungalow has two. Choose waterfront! Diving with Sandy and Maria was great! They love what they do and you can feel that. Good equipment, Professional diveguides etc. I cannot really compare this place to other places in Raja Ampat but it was definitely the nicest on our beach. I travelled a lot and I think corepen is a very nice place to spend a few days!! Great dive centre that organises everything for the homestay and are superb to dive with, much better equipment than we had at a large dive centre on Kri, thanks Sandi and Maria. Huts very clean and lovely over water, with hammocks to relax in. Food very samey and not very interesting although it was always edible and they always had lovely bananas out. Family barely acknowledged us at all the whole time we were there. Only 2 toilets and one shower for all huts and family use. It felt like everyone on the island were using the facilities, they were often busy and dirty, but they are building more. Finally, since the complaints about the dogs, the family put them all on a boat and dumped them in Friwen village. We managed to get them some mange treatment from Sorong and take it but were horrified to find out they weren’t there, and so went and found them on Friwen where they have basically been left to rot and compete with even more dogs for basics. I am so saddened by this that I would never recommmend anybody goes to Corepen. I understand it’s a different culture but treating any animal like this is unforgivable. We stayed in this homestay 7 days (in December 2018) and it was fantastic. The great advantage is the in-house diving center run by Maria and Sandi. They both speak good English. Sandi has taken over organisation of all events at the homestay, so tell him if you have any wishes with regard to snorkelling, bird watching or mangrove trips. The family running the homestay lives in Friwen village. As they are numerous, you will always see them around, preparing food, taking care for the baby or doing different things around the homestay. Always smiling, smiling, smiling … No tensions, no hurry. The family is really nice. As they do not speak English, direct communication is rather difficult. Sandi or others from the diving center may help, if you need anything from them. Dogs were always around (domestic and from other homestays) and it was fun watching their games and fights. Don’t worry, they are not aggressive – like the Papuans. Our overwater bungalow was new and comfortable, with large and thick mattress and mosquito net and two hammocks on the terrace. The food was tasty, rice and noodles, with different vegetables, soybeans pieces and chicken/fish. Fresh bananas were available throughout the day. Always enough food, also when the homestay was nearly full. The big dinning area with long tables is very convenient for socializing. There was a good company throughout our stay and we really had a great time. It looks like this homestay attracts nice and interesting guests. Most of them were divers. My husband was diving and I joined for snorkelling to all well known diving sites (except Blue Magic, due to strong current!). We visited Cape Cri, Mioskun, Lau Lau, Chicken Rif, Sardine Reef, Friwen Wall, Mike’s Point, Yenbuba Yetty and Sauwandarek Yetty. Sauwandarek and Yenbuba were my favourite snorkelling sites (school of barracudas, blacktip and whitetip reef sharks, turtles, napoleon wrasse, other big fish below the jetty). For coral reefs I liked also Mike’s Point and Friwen Wall. Divers were most enthusiastic about the Blue Magic, as they were so happy to see large oceanic mantas. Sandi, Maria and Harry take good care on all divers. Sandi was kindly trying to fulfil all wishes on where to go diving. There was always place for anyone who wished to join. In case of many divers, we split into two groups (on 2 boats) and went to visit different sites. For those that prefer snorkelling, there is a nice long sandy beach in front of the homestay, with excellent house reef just a few meters away in direction towards Yendebabo Homestay (variety of healthy corals, blacktip sharks, turtle, etc.). If you stay in the water for more than an hour, you will be rewarded with various marine wonders. It looks like the homestay has substantially increased capacities during the last few years. Nevertheless, it has retained its charm as a quiet place to rest and to enjoy good company. The smiling faces and the tranquillity of the Papuan family definitely contribute to a good mood. This homestay is a great place to stay. And the diving center is excellent. We highly recommend both. PS: If you can, bring with you a mask for the kids and give it as a gift to the homestay family. And do not leave any used plastic items (bottles etc.) on the island as they will end up in the sea. This could be your best contribution to the protection of the marine environment. I stayed at Corepen Homestay for two weeks over Christmas and New Year. I didn’t settle at first and couldn’t really pinpoint why, as this was my dream holiday that I’d spent a year saving to get to. However, as people came and went and the dynamic changed, I settled and started to aclimatise and enjoy my time on Gam. There’s definitely a few things the homestay could improve on; an additional bathroom when there’s a lot of guests and a toilet seat on the western style toilet. Also a ready supply of toilet paper and ensuring the bin is emptied regularly. The food was ok; I’d have liked more variety and more fruit but this is not an expensive resort. I had to ask for a change of bedding, I was staying 14 nights and with the temperature I’d have expected clean linens without having to ask for them. However, these were just little things, the main reason for going was the diving and Maria, Sandi and Harry do a great job. I was surprised that nobody asked to check my diving card / logbook but everything else was great. The staff come after dinner to arrange the following days diving. All of your equipment is set up for you and I was well looked after and assisted to cope with the current at some sites, which could be a bit challenging. It was Oceanic Manta season, just watching these giant creatures is amazing. So many fish and beautiful corals. The viz wasn’t great but that was due to the plankton that attracts the mantas. I hope to return and dive again when the viz is better. I was ill on my final day and Maria and her team were so good to me. Sophie gave me medication and Aris helped get me to the ferry in Waisai, I was feeling so bad I was useless! The homestay itself is overall a pretty good place. The accommodation and facilities are rustic, but generally clean and well kept (aside from having to ask got toilet paper a couple times). The bungalows as well, are rustic but the mattress is comfortable and the sheets and blankets are clean. The food, again, overall is pretty good but may be tough for picky eaters as there was not too much variety but usually rice, steamed vegetables and either chicken, fresh fish or tofu. 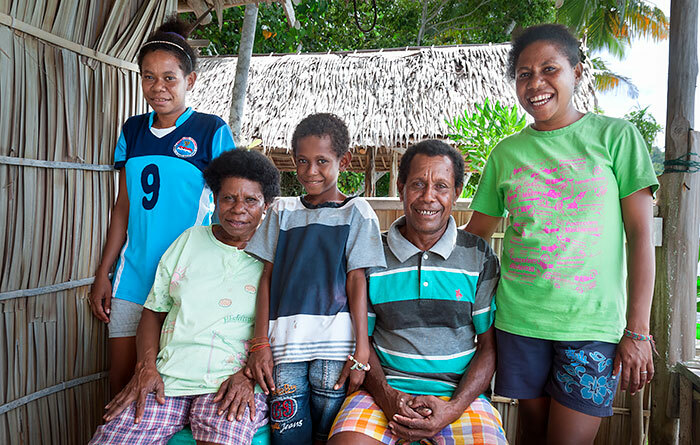 The family who runs the homestay does not speak English, any questions and requests need to be made through Sandi and Maria at the dive center, which they were quick to tend to any needs. Due to the language barrier, there was no one to greet us and show us around as Maria and Sandi are diving during the day, but other guests were helpful and Sandi introduced himself and let us know the plan as soon as he was back from diving. There is electricity from 6pm until after 11. However, the dive center attached is incredible. It is run by two experienced dive masters, Sandi and Maria, both are friendly, accommodating and really look after their divers. While the boat was sometimes full, we were never short dive guides and for a relatively new diver like myself they took care of me and I never felt like I was holding others back or was unsafe. During my first strong current dive, one of the dive masters, Harry, swam and pulled me through the current when I felt uncomfortable, clipping me in to the reef and assuring me that it was all ok! The gear was up to date, not to mention, set up, loaded and unloaded on the boat and cleaned by the hardworking staff of the dive center. The dive guides came to the eating area and socialized with guests, answered questions and talked about the diving plan for the next day each night after dinner. I thoroughly enjoyed my 8 days of diving with this dive center, and not only because of the amazing marine biodiversity and abundant marine life of Raja Ampat! We stayed in Corepen homestay 5 days in November 2018. In our 5 weeks in RA visiting more than 10 homestays we realize how difficult it is to choose them upon the comments. We try to give one star for each: beeing welcome by the staff/owners, accomodation/cleanness, food, housereef and trips. 1. star: In the morning we arrived noone told us ‘hello’ and which our bangalow would be our home. After talking with the familiy in bahasa indonsia they opened a little up and were actually very friendly. All, also the teenager children chew beetle nut. No star for accomodation: matrace on the floor, shared bungalow by a wall you can hear the neighbours, smelly hammock. The bathroom facilities were not enough (2 toilets, one shower for 10 bangalows). No star for food: Mostly RA standard tourist food (waterspinach without spices, boiled eggs in ketchup sauce, fried tofu or tempe, rice). There was sometimes a fisch but not enough for 16 divers. No fruits even tough it is close to waisai and the family anyway went daily for buying vegetables (we asked for it many times). No star for trips: the birdwatch trip was done in a way you felt the family was already a bit bored from showing the birds to tourists. We were told to be ready on 5 am while in the end leaving at 5:30 (we wake up the child who was in charge to take us). 2. star for the housereef however we were just diving it at a nightdive, this we actually recomend you to do. There is an electric clamp, decorator and orang utan crabs, walking sharks. Like everybody, we come to this place for diving. We liked it. The managers of the diveshop -Sandi and Maria- have no influence on the homestay, especially not about the food. On the other side they do the booking for the homestay as the owner Insemina works and stays in Sorong. Maybe the owner could take a little responsibility for the quality for the homestay as it is one of the worst value for the money we payed. We (my wife and I) stayed for 5 nights over new year in corepen Homestay. And we really enjoyed it a lot. Even though the staff of the Homestay is pretty shy, the staff of the diving center is happy to help out with all questions we had. They speak English very well, so communication is really no problem whatsoever. The rooms are pretty simple, equipped with a mattress on the floor (or bed in some bungalows) and a mosquito net, but sufficient for us. There was electricity available from the evening until midnight. The shower is an Indonesian bucket shower and they have both a western and Indonesian toilet. All facilities have to be shared with the other guests, but even with the Homestay being quite booked out we didn’t have any trouble with facilities being occupied for longer time. We did 8 dives total with different guides and really enjoyed all of them. In contrast to Til’s review we felt perfectly save during all of our dives. We had our license just recently finished before coming to raja ampat and told the guides that we were inexperienced. The guides were constantly checking in with us while diving and stayed near to us. Also, there was no chaos as described by Til. With having 2 guides for 4-5 divers, all was in order and though we had really enjoyable dives. We saw manta rays, sharks, sting rays and lots and lots of fish. Snorkeling directly at the beach of corepen Homestay is also a great experienced for days on which you don’t want to dive. Several boat trips can be arranged but should be taken with other guests together to keep the costs per person reasonable low (we went to Piaynemo with a group of 4 other guests and it was just great). The food is mostly rice with vegetables and chicken or fish and was quite good. All in all we can absolutely recommend this Homestay. First of all – the homestay did not provide us the booked room. We arrived one day earlier as planned and talked to Maria from the divecenter via telephone. She told us we would get a room in the 2-room-bungalow and be able to move the next day to our reserved private bungalow. Upon arrival we got a coconut each and were shown where our room is, nothing else. Nobody talked to us at all, we had to get all information ourselves from other guests. On the second day we got told that all private bungalows were already fully booked. We would stay in the 2-room-bungalow as there are no guests in the other room. The overall quality of our stay was not satisfying. The quality of food was mediocre, the toilet-bin nearly never emptied, having toilet paper in the toilet was pure luck. The times food was served were often too early and the amount of food not enough for all guests. The people who came last for meals did often not get enough food and the homestay could not provide more after requesting it. The worst experience was the diving. There were up to 12 divers at the same time and the dive center could barely handle the masses. Collecting the equipment and making sure everything’s on the right boat (they have two boats) was pure chaos. The equipment itself was of very varying standard but everything did work so far. The diving itself was chaotic as well and made me really nervous at the first dive. First you drive out with the boat to the dive site, put your whole equipment on. Then, just before the dive began, a very short briefing was held by one of the dive guides. No buddy teams were assigned by the dive guide, you only got assigned to a dive guide in a group of up to 6 people. That lead to chaos underwater: If you don’t get assigned to a buddy nobody knows who to look after underwater. If the divers don’t know in which order they (normally buddy teams) should dive, especially in groups of 6, you get chaos under water as well. The dive center can not stamp log books because they aren’t registered with any dive association. Okay – I guessed something like that beforehand. But the worst and most frightening experience comes last: With us there was a swiss couple in the homestay, I think they stayed almost two weeks at Corepen. They arrived roughly a week before us at a time where no other divers were there. Both of them never did diving before, not even a personally-guided discovery dive or anything. But the man of the couple did go diving at Corepen every day!!! Sandi tought him some rough basics and went out with him to even the crazier dive sites. When we arrived he told me that he feels safe underwater and another guest told him that he could see no difference in his underwater behaviour to experienced, licensed divers. That made him so confident that he continued every day. He went down to more than 30 meters, went to Blue Magic, Chicken Reef, Cape Kri, Melissa’s Garden, Friwen Wall and many other dive sites. Currents were only medium while we went out together with him, but he told us there were other days where he and Sandi (alone) had to use reef hooks to manage the current. I can live with many of the above facts, but risking a guest’s life like the dive center does is absolutely unacceptable. We felt so unsafe while diving that we moved away from Corepen after 3 nights. After our experience we will never dive again with a homestay, that is not member of PADI, SSI or another diver’s association. We went on to Kri and chose to dive with a SSI-certified Western dive center, the Soul Divers. The standards and equipment there were very good and the price even lower than diving at Corepen. I had great amazing dives here with Sandi and Maria. Both are enthusiastic and passionate dives who really make our dive experience one of the best! Corepen homestay has great food and relatively comfortable compared to its peers. They have just renovated the toilet and it is going to be fantastic for new guests. They are also great hosts as we joined them for church service on Sunday in Friwen island. The location is also in close proximity to all the great dive sites of raja ampat. From Blue Magic to Chicken Reef, it is just a short boat ride away. Highly recommend this place and don’t forget to ask for the bird of paradise bird tour. I cannot say enough good things about Corepen Homestay and the dive center. Bungalows are perfect for the price, food is good, and the homestay is very safe and trustworthy. Sandi and Maria from the dive center are great dive guides and very respectful and safe under water. Sandi is a certified diver and very professional. The boat guide is also fantastic. He’s friendly and very observant and safe following our bubbles while we dive. I don’t think he speaks too much English but he was a pleasure to be around. The dive center is one of the best in Raja and I will definitely back to dive with Sandi and Maria again! I had a very poor experience with my first dive center on Kri so I was very happy to be diving with Corepen diving. You won’t be disappointed with Corepen! Corepen is a must if you want to enjoy the most amazing diving, good snorkeling (join the dive boat or ask for boat trips, try night snorkeling with torches from the divecenter…), relax or socialize, meet people, do a little bit of birding, explore the beautiful area and eat plenty of tasty and variable food. Diving with Maria, Sandi and team (Raja Ampat Divecenter) was every day pure joy and fun. They are very experienced, professional and flexibel. They care for the needs and wishes of their guests above and under water and they make sure you get the very best out of your stay. If you are not that experienced they provide you extra human support, hooks, sticks… Whatever is needed that everyone can fully enjoy the diving. I guess many guests do more dives as planed, as it gets addictiv with them:). I also found the house reef worth to explore as every time i snorkeled i spotted different fishes, nudi branches, corals, claims (incl. electrical ones! )… one guest even saw a dugong! This is one of the most welcoming homestays I have ever had the pleasure of staying at. The bungalows and washroom facilities are great, and the food is out of this world – absolutely fantastic. Honestly some of the best food I’ve ever eaten. I also cannot speak highly enough of the diveshop associated with Corepen Homestay – Sandi and Maria are incredibly knowledgeable and experienced divers. They are professional, safe, and really take the time to get to know their guests. I was very impressed with how flexible they were and how they tried their absolute best (and succeeded at it) to ensure every diver had a an enjoyable dive. The equipment is well taken care of and all up-to-date. The boat staff are also very friendly, safe, knowledgeable, and experienced. Diving in Raja Ampat with Sandi and Maria has been some of my top diving experiences. The staff and family at Corepen Homestay and the diveshop are some of the most friendly and lovely people I have ever met. I will 100% return. The housereef is absolutely beautiful as well, and the birds of paradise are able to be seen very close to the homestay. Corepen Homestay is a fantastic place to stay – I would 100% recommend for snorkelling, birds of paradise, diving, hammocking, meeting fantastic people, and simply enjoying yourself in the most beautiful paradise you’ll ever see. This is truly a part of paradise. We stayed for 9 nights and really enyojed the whole time. Fantastic and nice family. Very good food and always enough. And Sandy the dive expert is taking it serious and is a real expert. Maria was only the first day but she was also very good. We did 14 dives and some excursions, all very good. There were some rain but mostly on nights. The weather out on the islands seem to be much bettet than Sorong and there were sunshine every day. Thank you Sandy and the crew, you were amazing. If you want the best and safe diving, go for Corepen! Very nice homestay with beautiful rooms right on the beach. Food was one of the best of all homestays, housereef nice for snorkeling with lots of nudibranch. At night after 23.30 when the lights are out, you can see luminescent plankton in the waves! We went diving for two days with Sandi which was great! He found so many things like seahorses, wobbegong sharks and so much more. Very handy that we could pay the diving with credit card. Loved the little puppy that walked around the homestay. Amazing place. Sandi and Maria are very accommodating and patient dive guides. Lovely family who genuinely care about their guests’ wellbeing. House is nice to snorkel with a wide variety of fish and coral, some sea turtles, occasional sharks and amazing night snorkeling opportunity to see octupi, squid, large nudibrancs and more. Wonderful food and we were told by almost everyone that stayed at other homestays that Corepen’s food was the best. We could not be happier! A few notes though about payment for your stay — the Waisai ATMs will charge you 25% to pull out foriegn money. You read that right. You will pay $25 for every $100 you withdraw. We didn’t know this and lost $300 in ATM fees. We suggest asking if you can pay for your stay and diving with a credit card and save yourself that financial mistake. The Jakarta ATM fees are a couple dollars, though, so if you need some cash, get it on your layover. We truly enjoyed our 22 days at Corepen and will be coming back. Thanks again to Corepen and to the creators and employees of Stay Raja Ampat for making everything easy and seamless. My only worry is that it was so easy and stress free that tourism will explode here and potentially damage the wildlife, but we understand that Stay Raja Ampat is doing what they can to ensure that doesn’t happen. We stayed for 4 nights at Corepen Hometay and wished we could stay much longer. We had a lovely welcome from the family who are all very friendly and nice, and our bungalow overlooked the water with a large mattress and mosquito net, and comfy hammock to relax and enjoy the amazing view. The toilet and shower were always clean and available, and the social area was nice to chat with other guests or make tea and coffee whenever you want. We stayed a few nights previously in a homestay on Mansuar, so were pleasantly surprised when we arrived in Corepen as the food was much tastier and more plentiful. Our main objective in staying at Corepen was to dive with Sandy and Maria, and that was exceptional! Every dive was unreal and makes you want more!! The equipment was very good and Sandy and Maria are both so knowledge and professional. We also snorkelled on the house reef which was nice, and visited Friwen wall which was fantastic. 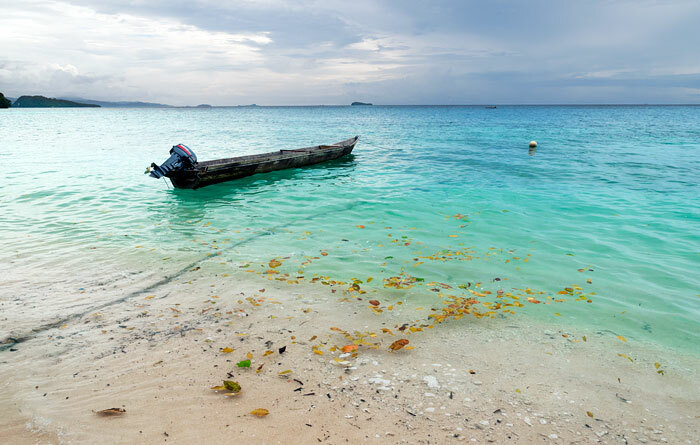 We’d also recommend snorkelling at Yenbuba jetty in Mansuar, but really nothing beats the diving! Thank you so much Sandy, Maria and Papa Alfons and family for making our stay so memorable – hopefully we will be back soon! I was there in Corepen at the end of April 18 for a week with my gf and other 2 friends,also a couple. Food was ok. Very basic bungalows, very basic toilets, shower etc. but thats not what you are going there for! nature n diving are amazing. Maria, Sandy, the captain and the boy that helps out with tanks, equipment etc are super sweet and nice. highly recommended for divers !! therimakasi Marti, Emma, Patti, Marco. Stayed at Corepen for about 5 days in late April and had a great experience. Location was just wonderful, fairly close to Waisai, and other islands like Kri and Friwen nearby. It sits right on a great little beach with a very nice house reef. The huts are basic but seemed clean and what you’d expect. The food was just wonderful in our opinion. Always plenty (during our stay there were about 11 guests in total) and a good variety, and very tasty too! English is not spoken by the homestay owners so communication can be difficult but not impossible…and if need be, Sandy & Maria from the dive center can help out. We were divers, only snorkeled, but had a good stay here, though I would say that the homestay seems to cater a bit more to divers. There are also quite a few huts at the homestay and they were building more during our stay so it’s a bit larger (but not by much) than the photos would indicate. We had one little issue when we arrived, as we had booked a waterfront hut but none were available when we arrived. But after a little confusion, they were able to put us in a water front bungalow that is adjacent to the homestay (it was a little confusing if it was part of Corepen or not). It was nice, a little more secluded than the rest of the Corepen huts but it ended up working out for us. My only suggestion here is that they should maybe make sure they are reviewing their reservations through this site, before making such decisions but they worked it out so no problem for us. The other suggestion, is to have the homestay hold up a sign that says “COREPEN” when they do pick ups in Waisai. We had a bit of confusion at that point as well due to the language barrier. This might help other travelers and the homestay in the future. All in all, this was a wonderful experience and we can’t wait to return. Would definitely recommend Corepen! We stayed a week at Corepen Homestay from 03/24 – 03/31 and we had a good time. The bungalow was basic and very clean. The matrasses were worn and it would have been nice to have a table outside. Showers and toilets were clean and basic too. The food was alright. They seemed to forget every once in a while that we are vegetarians what was really annoying. Furthermore, they mostly miscalculated the food if there were more people staying. So sometimes guests started dinner/lunch already while others (like we) were diving and there was not much left. The communication to get some more food was always a big pain. In general much less variety than on our first homestay on Arborek. The breakfast was always sweet for Westerners. For Indonesians there was rice and vegetables. We asked a few times for the same, but it happened only once and they seemed to forget it. My opinion is that there is less caring because the dives hop mainly attracts the customers. If you want some variety as one of the guys from the dive shop or homestay to bring you some fresh fruits from Sorong or Waisai for little money. As I see it, the pictures are a quite old. There are many more bungalows and a big dinning area were you can have a coffee, tea or banana. The diving with Sandy and Maria was fantastic. We enjoyed every dive. We felt very safe, the communication/briefing was good and they are great spotters. Make sure you dive the housereef, there is so much macro to see! We stayed 11 nights at Corepen and it was pure bliss! The bungalows are basic, as you’d expect, they could do with investing in some new mattresses and patching a few holes in the roof – but when you step outside directly into the sea that is forgotten! Toilet & bathing facilities fine – always clean, no seat on the western toilet though! House reef is great – you can swim at any time of day as it isn’t affected by currents and there’s a sandy channel you can swim out in at low tide. The diving with Sandi and Maria is superb! We were nervous about diving with a homestay as we’d heard lots of horror stories, Corepen was recommended and now we know why! Sandi & Maria are both highly capable dive guides, equipment rental was good – same standard as I’ve experienced throughout Asia and the diving – wow! Best 11 days of our 7 months away! Everything perfect and so nice! Food was delicious, Bungalow was basic but very nice. Diving with Sandi and Maria was perfekt. Also a very nice house riff. We did a night dive there and it was wonderfull. Do not expect anything and you will get everything. in about 6 days we are going to be in Corepen guest house. Electricity, telephone and internet info is on this page Marti. Our vital information section provides a heap of other tips and advice. I suggest no SIM card! :-) Enjoy the silence! Diving was well organised, we did 4 nice dives there. Great place, specially for divers! This was our first homestay in raja Ampat and we could not ask for more, nice front beach bungalow with a couple of hammocks, delicious food and very good organization. The house coral reef was also very nice! As for diving, we only have good words; we just got the open water so we were a little worried to begin diving in raja ampat but Sandy & Maria were very helpful and took care of us. They know very well the good diving spots and when to go there. Additionally, the diving material was good, with a great range of sizes (we had problems in other diving centers). In short, totally advisable! If coming back we would absolutely repeat! I stayed in Corepen for one week in early March ’18, to dive with Maria again coz she’s the one who run the dive operator (in other homestay) when i visited raja ampat back in 2016. Pak alfons is a christian (as most residents in raja ampat). If you understand indonesian language, there is a small church in neighbor island & you could request to go there with him on sunday morning. ◇ There are only a around dozen dive spots to choose from if you are staying in a homestay. Even me – who’s staying just a week – had to repeat some dive spot several times coz there are new guests almost every single day requesting to dive there and they were hoping to see manta on that spot. ◇ Diving was good, the reefs were super nice on 10-13 meters. If you are as crazy about reef as I am, ask to dive in Otdima Reef & Cape Kri, and stay shallow – the best view of coral reefs are located around 10 meters deep. ◇ unlike live aboard trip with its scheduled dive, here the diving is sooo chil. The 3rd dive is optional as they consider weather (rain may damage the visibility) & how many divers joining the dive. ◇ Sandi and Maria who run the dive trips are attentive & professional. They are very accomodative and look for divers underwater – I strayed once and Sandi came to the rescue. All in all, a week in corepen really super charged my soul. Had my fill of vitamin sea here and will come back for sure. in february we had 10 wonderful days at korepen. diving and snorkeling was great! pak alphons, insemina and their family cared so nicely and gave us even a feel for the traditional raja ampat biak lifestile. and for the diving and the guest management sandy and maria do a very good job. a great team on a beautiful place. we too were surprised about the many bungalows (and guests!) – so it’s quite busy with all the coming and going. please don’t expand anymore! Corepen was our first homestay in Raja Ampat, and although we were a bit overwhelmed by the amount of people and bungalows (we expected only two bungalows) and there now 7 or 8, it all turned out well and we enjoyed the friendly atmosphere and the nice company. We stayed for 5 nights. The bungalows were nice, we especially liked the older over-water bungalow we moved to for the last two days. The food was really varied and tasty, with for lunch and dinner always fish or chicken, and rice or noodles, and vegetables and sometimes egg or tofu or tempeh. For breakfast mostly something small and sweet, with the pancakes or pisang goreng as favorites. There was always enough cold and hot water (to make tea or coffee) and bananas throughout the day. The two toilets and one bathroom were clean and available all the time. The housereef had lots of different corals, but when we were there the diversity of fish was less than we expected, though some people even spotted a dugong! For snorkeling we went to Friwen Wall, which we liked very much. We even had tea and coffee at Friwmunday Wall Homestay which was a pleasant surprise. This homestay looked very nice as well! We also went to Yenbuba jetty where there were a lot of (bigger) fish, a.o. Napoleon wrasse and humpback parrot fish. Since we would be going to Mandarin Homestay later on, we didn’t go to Manta Sandy, and some other places. Although we liked Corepen very much (Thanks Insemina for all the great meals and Pak Alfons for the nice snorkeling trips and the transfer to Pulau Mansuar!) maybe it makes more sense to go there if you are a diver. So from our snorkeling perspective it is 4 starfishes. Мы с женой посетили Corepen в марте в течении 6 ночей. Привлекало близкое расположение от порта в Waisai, где была встреча своевременной и внимательной и быстрой доставкой в хомстей. Предоставленный нам домик был в хорошем состояни, постельные принадлежности новые. В домике чисто, есть 2 гамака, в которых приятно проводить свободное время. Приятно слышать шум волн. Снорклинг рядом и не плохой, по сравнению с другими разрекламированными странами даже лучше. Но лучше заплывать во время прилива. Везде встречаются течения, но не страшно, всегда можно изменить направление плавания. Территория чистая. Душ и туалеты в норме. Приготовленая пища вкусная. Если хочется плотнее завтрак- привозите с собой печенье, сладости. Мы любители снорклинга, поездки по островам совершали ежедневно, кроме воскресенья – праздник. (но после обеда дайверы выезжали на острова). При поездках на снорклинг обязательно нужно договариваться о времени нахождения на острове и колличестве ваших заплывов, так как через 40-50 минут хочется отдохнуть и снова в воду. Но вам сразу предлагают ехать домой. И поездка на остров получается очень короткой. Для тех кто хочет уединения и тишины лучше выбирать хомстей, где меньше домиков. Сейчас в Corepene может собираться за столом до 14 человек и еще планируется строительство. Отдыхом мы довольны. My wife and I just spent 10 nights at Corepen and had a lovely time. The bungalows are very comfortable with two hammocks in each and clean communal toilet. Food was very tasty and plentiful and always on time. We did a 10 dive package with Sandi and Maria who were great to dive with. Corepen is very close to all the good dive sites in the area. All in all we had a fantastic time at Corepen – little bit of paradise! My wife and I stayed at Corepen homestay for a week in the middle of January 2018. Homestay itself has good combination of location, nature, comfortable accomodation, price and cozy atmosphere. Way from Waisai isn’t pricey and just 40 minutes. Coral reef near homestay is very interesting. We saw baby shark right under our bungalow twice. Parrots (cockatoo and parrots eclectus) come from jungle many times. The family and dive instructors do their best to make your holydays unforgettable. Everything is clear, meals are good and enough. I am staying in Corepen from the 28th of February to 7th of March. Is it necessary to arrange diving beforehands? Things like number of dives (5 days * 3 dives a day), equipment rental (I need most of the equipment) etc. If so, can somebody provide the telephone or e-mail (whichever is more reliable) of Sandi or Maria? I sent an e-mail to corepenhomestay@gmail.com to confirm the booking and provide the details for the diving like 10 days ago but haven’t got any reply at all. I will try to call/text them as well. Hello Manos, normally it was not necessary there to reserve diving in advance, unless everyone staying there goes diving at once, but room – definitely. They were often full. I have a number of Sandi, let me ask him if he minds that I publish it here. Please leave your email address or other contact for the case he doesn’t want his number to be published. seems like we’ll be dive buddy since I’ll stay on Corepen from 26th Feb to 5th March :D look forward to meeting you in person next week! We stayed at Corepen homestay in December – January 2018 for a total of 17 nights and dived almost every day at their divecenter with Sandi and Maria. We know Maria from our previous visits to Raja Ampat in 2013 and 2016, and as always before, diving this year was perfectly organised and conducted, and was very interesting. Maria and Sandi are excellent spotters for small creatures (pygmy seahorses, shrimps, etc.) and know very well all the dive sites in the Dampier strait, with all the difficulties and different approaches related to tidal currents, which can be very strong sometimes. Sandi is a divemaster with many years of guiding experience in Raja Ampat, he previously worked at one of the resorts. We always felt safe diving with Sandi and Maria. Corepen homestay had a few bungalows with terraces on stilts directly on a beautiful sandy beach, and 2 newer bungalows at the back at the time we visited. There was a communal bathroom and 2 toilets at the back, with good quality sweet water always available. Cold beer was there most of the times. The food was quite diverse, not only fish (they made a perfect yellow fish soup, by the way) – 40-50% of the meals were chicken, often complemented with eggs in tasty red sauce. One could always take bananas in the dining room, and coconuts were often available as well. Breakfasts often consisted of a cake only, but we and other guests sometimes asked for more substantial meals – and fried rice, noodles or pancakes were prepared. There is an interesting house reef with beautiful corals just a few meters from the beach, we have often seen reef sharks and turtles there. It is also interesting to swim further ahead to the right and around a few islets next to Kordiris homestay, but beware of strong tidal currents in the deep channel between those 3 islets close to Kordiris, and 2 other further towards Mike’s point. Go there around high or low tide to avoid currents, but I would not recommend to cross that channel at any time. The location of Corepen is very beautiful, on a small meadow with coconut trees. One can walk on a path through another small coconut plantation, or directly on sandy beach to the neighboring Tau Yado and Yendebabo homestays, where phone reception was normally better. Directly at Corepen the data connection was often good enough, but strangely at the same time it was often impossible to make calls. If using a dual-sim phone, switch off the second sim, this can improve the connection. There are a few paths in the forest behind Corepen. Right at the homestay it was possible to see flying green or red parrots, and once early in the morning I’ve seen a sulphur-crested cockatoo (probably). For room bookings and transfers from Waisai we communicated with Sandi, and both times the boat came on time to pick up us. We spent 6 lovely nights at Corepen in mid January 2018. Booking, communication, and pick up went smoothly (perhaps it helped that I speak Indonesian). The huts and facilities are as described (by photo and also have been elaborated many times in different reviews). It was generally clean and well taken care of. Alfons and crew were always very helpful and willing to cater to our requests for outings/excursions. Alfons was also quite straight-forward with rates of the excursions, which were in line with what was posted in this site (so we didn’t need to negotiate it, which was great for us). Once, we wanted to go with the whole group (7 people) to Kabui bay, which would not fit in his long boat. So he was kind enough to arrange a bigger boat from his friend, and charged us the same price as he would with his boat. Lunches and dinners were great, really nothing to complain of! Typically, it was 1x fish and 1x chicken dish in a day (so one for lunch and one for dinner), everytime with rice, plenty of veggies, and a side dish. Bananas were also always available! Breakfast was a bit on the lacking side, mostly cake of some sort. We brought some instant noodles and crackers with us, and we were happy to have them. The housereef is also quite impressive (for me) already! We saw reef sharks and sea turtles on a number of occassions. Furthermore, Alfons (or Sandy or Maria) can always offer you places to go snorkling (or diving). We especially liked the Yenbuba Jetty. I stayed there for some nights at 01/18 and enjoyed diving with sandi and maria so much. Thank you!! Sandi also took so good care for other questions when calling himfrom other homestays (booking,transport…) and Maria even get mea needed equipment part for diving. So great!! I did not have so much from the food,because I am vegetarian,but they others told me it was good. We had bioluminiscence at night,sharks and turtles in the housereef and at least you can walk to the next two homestays at low tide,which is morepossibility of movement than in other places I got to know. Themosquito net was fine but there were no mosquitos at that time.Also no sandflies. So, I can recommend that place. We stayed a week at Corepen beginning of January. We dived and snorkelled with Sandy and Maria. It was great. Very good house reef, good food, everything clean and tidy. We particularly appreciated the big moskito net. In the beginning difficult to get in touch with the very nice and friendly family, they were busy serving everyone. Now they have 6 bungalows on the beach and 3 behind. Please, don’t build more!!! It’s the homestay atmosphere we like and the contact to the local people. The bigger homestays are not so different from more anonymous resorts just lacking the comfort. The communication was fast and easy and the boat pickup also worked very easy. I only can recommend corepen. We had a very good time we will never forget! Corepen was our first homestay in Raja Ampat and it was lovely. The food was fantastic (in fact, the fried chicken there was probably some of the best we’ve had ever!) and the setting was beauteiful, especially its dining room. The house reef is also very nice and we even saw dolphins and sting rays without even getting in the water. Although we only snorkeled, Corepen is great for divers as the homestay has in-house dive guides. Sandy and Maria (formerly of Kordiris homestay) keep their boat at Corepen and take divers out every morning. Snorkelers can join if the trip is good for snorkeling and there’s room on the boat, although we never did this. Note that Corepen now has around 6 bungalows (2 on land, 4 on the water) and their dining room has expanded significantly compared to the pictures on this page. We also stayed at Beser Bay (5/5), Yenmakrak (3/5), Mangkur Kodon (5/5), and Warimpurem (5/5) homestays if you want to check out our reviews for comparison. I really liked Yenkarom on Birie Island for off the beach snorkelling. And if you choose friwmunday wall homestay you can just jump in the water and snorkel the famous friwen wall or – 1 min away on the other side of the island” a nice snorkelling off the bach with sharks and bumpheads at the dropoff. Loved that place! Thank you so much to all the staff at Corepen! You truly did make our trip! We only initially planned to stay for a few days but ended up spending our entire time in Raja Ampat at Corepen. One tip when booking is be patient! It’s so easy to get frustrated when you are trying to book but once you are there you will understand why. No one is purposely ignoring you they just have very bad signal and try their best to answer as quick as they can. A lot of people complain about the transport in Raja Ampat but Corepen were super reliable! The transport is a little bit expensive but it is the same for all the homestays (corepen is actually one of the cheapest) and when you are there you appreciate how far the fuel has to travel and so why the price is high. Food was great. You will not go hungry! Each meal is served buffest style and there are a variety of options, lots of vegetables and fruit! We did the bird of paradise tour and that was great! Such beautiful birds! It’s only a half hour walk into the jungle from the homestay so you don’t need to miss any diving! We were very lucky and had a cuscus feeding in the tree next to our room which was super cute! The piaynemo trip was amazing! The two dives were really beautiful then you walk up to the view point to get that travel brochure picture. The diving is just out of this world. Every single dive we seen something new that we had never seen before on top of hundreds of other creatures and we loved every single dive we did. Thank you to Sandi for being so accommodating! We came with a list of dive sites we wanted to visit and he made it happen! We did most dive sites twice as they are so incredible and once wasn’t enough! Sandi and his guides were fantastic! We seen so many incredible little (and big) creatures thanks to them, took so many amazing pictures thanks to them! They were so patient and helpful and even fulfilled our wish list of creatures to see! I cannot recommend Corepen enough! I had a great stay at Corepen Homestay for 3 days in November. The location is great and it has a beautiful beach to relax on and you can snorkel out to the housereef. The family is friendly and helpful although don’t speak a lot of English. Thanks to Sandi we went diving everyday and it was very well organised. It’s suitable for solo travellers because you can meet other guests and share the boat trips (which makes it more affordable). Also they cook nice food with a lot of different dishes. It’s less busy here than on Kri Island which is nice. Also this dive operation works much better than some of the other ones on Kri. The pick up/drop off from Waisai also worked well. Corepen Homestay was our first homestay in Raja Ampat and we stayed 3 nights. The homestay is very nicely located at a beautiful beach. The house reef is truly phenomenal. Simply walk in from the beach and you can admire the large variety of coral and fish species. We also made several snorkeling trips, to Friwen wall and Yenbuba jetty. Both were very beautiful, especially snorkeling at Yenbuba jetty is highly recommended. Crystal clear water. We saw sharks and turtles, and many different fish species. But be aware of the currents! Also we went for an early morning hike and we saw the magnificent red bird-of-paradise high up in the trees. At this moment the place is engaged in construction activities to expand the homestay with more houses. Hopefully the homestay feeling of the place will stay intact. In general all meals were delicious. The homestay family is very nice. Thank you very much for your hospitality. I highly recommend Corepen homestay for anyone who likes sea life and a relaxed atmosphere. siamo rimasti une settimana in questa homestay,ben tenuta pulita con spiaggia molto piacevole e buon snorkeling davanti..centro di plongée competente ma di dimensioni umane ,quindi solo vantaggi.Buona cucina. ho visto che hai girato parecchio a Raja Ampat, per caso hai visitato anche il rajaampat ecolodge a Misool? Qual è l’homestay dove ti sei trovata meglio? Nothing but good words to this absolutely fantastic and friendly homestay. I felt like at home. It is located in a perfect quiet beach sorrounded by palmtrees. The coral reef is nice. The bungalows in front of the beach suitable. Not luxurious, but confortable enough. About the food, very good. Rice, fish, chicken cooked with so much love. The staff is very kind. One of the best chacateristic is that they have their own dive shop, which allowed you to do lots of the trips! I hope I will come back soon. V there. Sorry the mark it was wrong in the last moment I do not know why. Corepen Homestay is a hidden gem on earth. Wonderful & healthy reef, awesome jungle starting right in the backyard, and very lovely hosts. I stayed there for 8 nights during my 16 days in Raja, and had a great time. The dive was well organized, the equippment is okay, and Sandy and Enzo are the best Dive Guides I had there – passion for what they doing, friendly and always take care of the guests wishes. The hut was in a really good condition, plenty of yummi food, and fresh Coconuts (thank you for climbing the tree for us :-) ). The only downside (as general in raja) there is no recycling, and often visitors leave their trash there or through it in the ocean – please take your trash with you back to Sorong! I can really recommend Corepen to everyone who takes care of Mother Nature, and want to have a wonderful experience of it. Thank you! I stayed in Corepen in September for 6 days and it was a wonderful experience. Even though I was not diving I joined the daily trips for the divers but in my case only for snorkeling and I saw many sharks, turtles, bumpheads, Barracudas, a huge Eagle Ray and many other fish. Enzo and Sandy were great all the time, very professional and easy-going. The only downside for me is that since that was a Homestay I was expecting to have more interaction with the family to get to know them better. Anyway this is not a problem of Corepen only, all the homestays work the same way and you’ll be always treated as a guest even if you want to get closer and become one more of the family. I’d recommend everyone to go to Corepen, the location is very good and to me Gam is the best island to stay. Just back to Sorong after 13 days at Corepen Homestay. I went there for the diving and snorkeling and I am glad I did (sharks, turtles, mantas, big groupers and humphead parrot fish, etc and healthy corals – lots of them). Saw birds of paradise on a 30 min jungle trek just behind the Homestay and snorkeled a mangrove just a couple of coves away. The food was great too and the home owners nice and friendly. All was perfect with reservatios/pick up and drop off. I strongly recommend it for all ocean lovers. Meet a lot of them out there. Special mention to dive master Enzo and Sandy, thanks for having my back during decompression and for finding the way back through the storm. Hope to return one day. Corepen’s contact numbers and email address are provided above jordy. we spent 24 days in Corepen and every day was great! The family was very attentive to our need, food was plentiful and good, there was always banana for free snack. The home stay is well-kept and clean, it´s a shame that the many dogs there sometimes ruin the effort put into keeping the place pleasant. Thanks to Mama, Papa , Insemina and all the staff. The diving with Enzo, Sandy, Aten and Ebet was best organized and outstanding, at least one diver´s dream has been more than rewarded thanks to Enzo and Sandy! We hope that all of you did make a swift recovery after the “crazy diver” left! Come to Corepen and dive with Enzo and Sandy, you won´t regret anything! We had a wonderful week at Corepen Homestay, it truly is paradise!! We travelled to Raja Ampat for the diving and were delighted to find a very enthusiastic diving community at Corepen between the other guests and the dive guides. We went diving three times a day with Sandi and Enzo, who have many years of experience guiding divers in Raja Ampat. The homestay itself was very comfortable and the meals were delicious, with options available for vegetarians. There are a few more bungalows then stated on the website but there is still a small, cozy, family feel to the place. We would definitely recommend this homestay for anyone interested in diving!! You won’t be disappointed! Corepen is a great place to spend few relaxing days. It is not exactly as you can see in the photos, it’s better!! Three bongalows over the sea plus 1 more in the beach. Comunal areas are improved as well. Two toilets, one wester and other local, are divided by the shower box. Always clean and with paper. The grades is also clean and carefully maintained. Specially the food is remarkable: always enough. It is not luxury but more than enough to spend days in the paradise. Let me recommend you to dive in the dive center located in the same homestay. Enzo is really helpful, he is a lovely Italian diver master who knows perfectly the are. We spend with him the better Dives we ever made. Thanks to Enzo and the family we spent there four unforgettable days. We loved staying here. The accommodation is clean and lovely. Bathrooms are really nice. Communal area is great as it is right in the middle on the beach so lots of people around all the time to chat to. Food is excellent, lots of it and pretty varied-very tasty. The home stay owners are friendly but quiet. The best part was the diving-we were a little worried before coming as Chris was leaning to dive the week before we arrived here but Sandy the dive master is amazing. He made us feel totally safe and always checked current/ conditions to make sure it was suitable for us. He kept such a good eye on Chris in the water and knows the dive sites so well. The equipment was in good condition. We had amazing dives here-saw so much. Definitely recommend this place and Sandy. We had so much fun diving here. Great homestay great food family beach and coral. Excellent sunrise views. The dive centre w Enzo n Sandi is a big plus and both are great guys. I highly recommend this home stay and dive centre. Injo Nabor Everyone! We stayed four nights at Corepen Homestay this September. All in all the homestay is really clean and offers nice bathroom facilities (the best we´ve seen in Raja so far). We also went diving with the local dive center. Sandy our dive guide did a great job and showed us many of the area´s signature dive sites. He really tries to fulfill all the wishes of his guests. Besides that he helped us to organize transport etc. Preparation, equipment and the boat are really nice. I highly recommend Corepen Homestay! Would you recommend for a solo traveller? I am planning to come to RA for about a week very soon but I am not sure whether this would be ok for me on my own? Thanks! It was really nice and I think it’s cool for solo travellers. The only thing you have to be aware of, are the high costs for boat transfers and day trips. It’s way cheaper if you share it with other people. You will love Raja Ampat! The location it’s simply amazing. The bungalow are basic, but what do you need more than a bed and an hammock to relax in this paradise? Food was really excellent. I stayed here for diving, that it was really impressive for the marine life that you can find here, in the house reef too. The diving center is really good, all the dive equipment is new, and the dive guides are simply the best. Thanks to Sandi and especially to my compatriot Enzo. We stayed 3 days in August, this was by far the best of the 3 home stays we stayed in in Raja Ampat. Very friendly family, good food and Sandy organised our trips well. However, there were also negatives: we only snorkeled (which was good) but also came here because of the nearby birds of paradise spots. This was disappointing as on 3 different walks we saw nothing. And the people in the home stay knew the birds had disappeared as they personally cut down the trees where the birds used to display to use the wood to build more huts for tourists! This is rather unfortunate to say the least. In summary, a great place to stay, good snorkeling but don’t come for the Red Bird of Paradise. We were very happy to have stayed for 6 nights at Corepen. Good food, paradise location and really nice family. Highlights were a visit to Friwen village where a local party was held with traditional music and dancing. the real experience! Diving: we were very lucky to be able to do 10 dives here. You can visit the same dive spots as from Kri and the equipment/boat/service is fantastic! Sandy was our guide and we were had such good and well planned dives. Even lucky enough to have Sandy who spotted a ghost pipe fish and the lembeh pygmy sea dragon (house reef!!). Fantastic. I spent about 1 week in Corepen beginning of July this year. The resort is as described : simple & authentic. The family staying there is really friendly and welcoming. The food is good and filling. We got caught a couple of times in strong current by surprise but they acted quickly and efficiently by securing the less experienced divers with hooks. Nonetheless be careful about your depth if you don’t have a computer. They won’t remind you constantly to keep the same profile as the guide. So you have to be a little bit independent but I don’t have any problem with this. Anyone is responsible for its basic safety. Overall highly recommended, especially given the price gap with dive resorts. Our 3-night stay at the Corepen Homestay was incredible and perhaps the most memorable of our 2 months in Asia. The diving with Sandy and Maria was what set it apart. Both are so friendly and knowledgeable about the reef systems and diving instructions- we felt safe even as beginners! Chicken Reef, Sardine Reef, Blue Magic, Friwen Wall were all incredible dive/snorkel spots. The meals were simple, but filling. Falling asleep and waking to sounds of waves coming hitting the shore took some getting used to, but was so peaceful and serene. Insemina was super helpful and her host family was quiet but always had smiles on their faces. Thank you for the memories!! Enjoy this peaceful paradise. Very nice place in the jungle with a beautyful reef in front of the cottage. Thanks for Mama, Papa and Incemine for your hospitality. As above, it costs IDR 500,000 to get to Corepen from Waisai. See this page for how to get to Waisai. Homestay is clean and good. People here is good guy. But for meal, I think there is not enough food for all when there are many tourists. I faced this situation when there is another group with four persons come to homestay. Meal is served as buffet. I think, homestay should separate meal for each group. Lovely basic homestay with good food. Great diving near by and Sandy and Maria are excellent dive guides! Nice homestay and amazing people. It’s our second visit to Raja Ampat. This time we stayed at a beach front bungalow between 8-14 April 2017 and enjoyed every minute of it. Highly recommended. Insemina and her family looked after us very well, food were great and our kids enjoyed playing with her and Daud. We noticed the water was very clean and fresh not the typical brackish water by the beach. There were only one bathroom but when we were there they were building new ones closer to the bungalows. They also have a dive centre, Maria and Sandy, the dive guides, were very helpful and looked after my wife very well when she dove with them. Thank you, Insem and all, we look forward to returning to your place again soon. Fantastic homestay. Good food and good value. Nice room right on beach. 5 great snorkeling trips all well organised and safe. Our 4th guesthouse in Raja Ampat and probably the best. This is an amazing place not only because of the location but because of Maria and Sandi who run the diving. They are extremely professional and excellent dive guides and really helped me feel comfortable. The family who lives there is lovely and overall I felt that they couldn’t do enough to make your stay comfortable. I will definitely return to this special place. Thank you for a magical few days! Corepen Homestay was the second of the four places we stayed on our trip. It was definitely one of our favourites with a great overall experience. First off the communication for pickup was easy and arrived to a hut on the beach. Food was good and the people very kind albeit quite shy. The snorkelling was very good on their house reef with lots of fish and good healthy corals. The beach is equally good with hermit crabs scattering along the sand. We dived here with Maria and Sunni (might be wrong name, sorry!) and compared to the other places we dived it was very good. The equipment was new and in enough different sizes. The great thing about this dive centre is not too many people dive as there are only 3 huts for people to stay in, although there are other home stays nearby. Both dive masters were professional and controlled the dive nicely. The only thing I would say is it would be good if we had slightly more information regarding the dive site and what we can expect to see and what is there, but overall we wished we had done all our diving here! The other point I would mention is you cannot see the Red birds of paradise here anymore apparently. This, I heard is because they are cutting down trees (there was a lot of chainsawing going on) in the forest to build more huts and as a result the birds have moved away. I think this is a real shame as if we hadn’t seen them already on waigeo we would have been disappointed. Like all the home stays one of the BIGGEST selling points is they are small and don’t have many guests which is what many people look for when they come to Raja. Overall though we would definitely come back here and do all our diving here. Thank you! It is better to learn first to fight underwater before you go to Raja Ampat because they have no dive rules. I was unlucky that I have the wrong company in Corepen homestay . I had to dive with a Canadian who have his first Gopro and he have the mentality me, me, me, me, me and my Gopro and the rest have to go out of my way and when we go to blue magic there where already around 20 divers making a half circle for to see 3 Manta’s and there he came over me push me on the coral and stamped me 10 times with his fins on my head so that I need my both hands to safe my dive mask but he look not back what he was doing and the only thing he look for was I must have the Manta full in my Gopro screen and the rest is not so important. The dive guide Sandi was behind me and have seen what happen but he find that behaviour ok. Dive guide Sandi look only for the person who spend the most money and look not good for all divers in his group. Corepen homestay can be good if they change the dive guide Sandi for someone who look for all the divers in his group. The people, the surrounding, the vibes, the service were all beyond expectations. Wishing all the best for Corepen Homestay. Keep it goin guys!!! 😁💪👏🎈💞 Ada jodoh, ketemu lagi kita ya. We had the most amazing diving vacation with Maria and Sandy from Corepen homestay. We did 21 dives with them. They know the dive sites, currents and take you to the best places. They have very good equipment and they did everything to make sure we had amazing dives. Even when it was just the 2 of us wanting to dive they took us always on the boat, we did up to 4 dives a day. We got to dive with mantas, Sandy knew where and when to find them. They asked what we liked more and took us to the most beautiful coral gardens. It was an amazing experience and we would recommend anyone to go dive with them. They are professional and passionate divers. We stayed in the neighbour homestay Tau Yado and it was a great experience. It was clean, the food was extremely good, the beach is amazing. It has a really cool swing and the family is really nice. We had an amazing time and cant wait to go back! I stayed in Corepen from 25-30 January 2017 in one of the 2 huts that are over water with high tide. Fabulous. The room has 2 mattress on the floor with sheets and pillows plus mosquito nets. There are 2 chairs on the terrace facing the sea/over the sea at high tide. The shared “mandi” – Indonesian scoop shower – and toilet worked very well. Food was good and tasty and water/coffee/tea available throughout the day/evening. There is a dive shop managed by Maria and Sandi and their prices are very reasonable. Boat trips with one of the boats from Corepen are very reasonably priced. We did several shorter trips to snorkel and visit villages. Friwen Wall is a must and Friwen village is lovely. We even got a free ride on the Sunday when we went with the family who were going to church on Friwen Island. Pak Alfons and his wife plus daughter Insemina are very helpful. We also sailed the inland lakes of Gam Island in the late afternoon with Alfons. Great stay. I can recommend this place anytime. Very special and secluded. A 3rd hut was being constructed while we were there, so it should be ready by now. We stayed 6 nights (beginning februari). We enjoyed our stay every minute! Easy pick up with a longtailboat from the port of Wasai to this amazing paradise place. There are 2 (at the moment maybe 3) over water bungalow. The family is very nice and take really good care of you. They speak indonesian, bit still you can tell them with a little Indonesian words and hands what you mean. The food is very good, we enjoyed every meal (fish, chicken, tempe, tofu) with nasi putih or mie goreng. Keep in mind that everything is fresh from the market every day and there is no fridge. Tea, coffee and water is available all day. And if you want water with a taste, they serve limes on the the table to make soda yourself. The bungalows are very basic, for us, just what we were searching for. A matress on the ground with a musquito net. Also a small veranda on the beach and with high tide above the water. You can also snorkel in front which is also pretty good. Or walk on the beach to thr next homestay were it is easy to spot cockatoo. Since 2 months Maria and Sandi have a diving shop here. So it is easy to plan your diving trips or if you need to translate and tell the family want you want. Ask for fresh coconuts from the tree. Also it is possible to look for the red paradise birds in a short hike in the jungle. And if you are not lucky they are willing to help to go to another place were you maybe more lucky (I think Yenbuba homestay). We were lucky and saw 10 paradise birds dancing in one tree. Because there are not many bungalows it is quiet and a perfect white sandy beach hide away. We enjoyed every day. Thank you so much. Looking forward to come back dome day :-)! We stayed at Corepen for five nights and just loved it! The bungalow huts on the beach are very simple but clean and have everything that’s needed. On the porch you can hang your wet stuff, watch a wonderful sunrise or just hang out. We didn’t have a hammock but Maria gave us one. Everything is clean and well looked after. We had a few mosquitos, not too bad, but some bug spray might come useful. Also, bring a flashlight, since the generator will be turned off around 10:30/11:00 and a walk to the bathroom hut will be an adventure, especially during new moon nights… the “shower” comes with fresh water, which, as we heard, is not the case on all the islands, and there are no rats on the island (also apparently not the case everywhere). The food is fresh, delicious and with enough variation to not get tired of it at all and there is as much coffee, tea, water and bananas as you like. The family is lovely, they do not speak much English, but Maria is happy to translate, if necessary. Diving with Maria and Sandi was awesome, they really listen to your needs and interests and the equipment is also very well looked after! We loved the intimacy of just two huts and not many people, so if you look for something like that, Corepen is the place for you! They we’re just building the third hut while we stayed there (beginning February 2017). There’s three huts built right on the beach which is fabulous simple yet comfortable and clean. We brought our own hammocks and watch the world go by. Good location for all the snorkeling sites and their boat rides are good rates. Lots of birds behind the home stay and you can walk to the other beach next door with lots of different kinds of parrots congregate in the early evening on the trees. I really enjoyed my stay at Corepen Homestay. I was there for 4 nights for diving. The diving with Maria and Sandi there was just wicked. They are very good spotters and the equipment was good. The last two days it was just me and them so I had two diveguides for myself^^. It is also possible to dive with them without staying in the homestay too. The homestay is quite new and you will get a bungalow (there are two) directly at the beach. My bungalow was basic with a matrace, little table mosquito net and it was clean. Ebet (an employe) borrowed me his hammock so I could lay on the porch when there was no diving. There is a bucket shower and a bucket toilet behind the bungalows. Again very basic but clean and new. There is electricity in the evening. I liked the food which is included. This place is awesome! Your perfect hut right over the beach! And there are only two so it feels very private. The local family is super nice and now Maria and Sandi are staying there who are not only great company but offer awesome diving (they also speak very good english)! In my case the food was pretty good, also compared to other homestays. Two times we had the most amazing spanish makarel, best fish I ever tasted. Maybe the cook improved and they learned from their early days? Breakfast is simple at most places but somedays they made Banana Pancakes at Corepen which seems rare at Raja4. Also electricity was available from around 6pm to 11pm. No light yet in the hut (only veranda) but they working on it and a plug to charge your electrics is provided in the hut. Blanket as well as towel provided which is not the case at all homestays. The location is awesome in a small hidden cove with purple rocks to the one side and a sandy beach right in front of you. Bird of paradise can be seen in the back by a 20 min walk (IDR 100k). Cacadoos and parrots fly around and dolphins can sometimes be seen in front. Maria and Sandi offer diving for reasonable prices. I am a beginner diver so I was skeptical to dive in Raja Ampat with Homestay but they both made me feel very safe at all times. Equipment is in very good shape and we were always small groups. They are most keen to search pygmea seahorses for you.. We even went diving when we were only two guests so it was one guide per guest. Also trips to Penemu and Manta Sandy were offered at fair price. If you want something more private than Kri with a great dive center, this is the place! I stayed a few days here in november. There is no electricity, you don’t get a towel and the food is very simple. Once it was just rice and tofu. My opinion is the price is far to high for what you get. Especially comparing to other homestays. The family lives in the other bungalow when there are guests. They are friendly. but it is a bit strange. Once the brought lunch at 9.15. And they couldn’t understand, that I asked to give it later. Inside the bay is no current but be careful when you swim out. The current is very strong there. They now have electricity in the evening. They provide towels and food has improved tremendously with fresh fish and loads of vegetables. We stayed there on the late Jan 2017. The homestay is still relatively new and new things are still being built, but this was a great place to be. The beach is amazing, there’s great snorkeling just a few meters away, and the family that runs it is very friendly. The food was basic but delicious. Make sure you ask to take a trip to Pasir Timbul if you stay here!